OCEAN COUNTY, N.J. (WPVI) -- Five people have been arrested for drug sales in Ocean County, New Jersey after a two-month investigation. The suspects were allegedly involved with a large scale of heroin/fentanyl and cocaine distribution network. Authorities issued three search warrants at locations in Toms River, South Toms River and Berkley Township back in December. These search warrants were the result of the investigation by the Task Force involving Fentanyl distribution by a Philip Tarver. 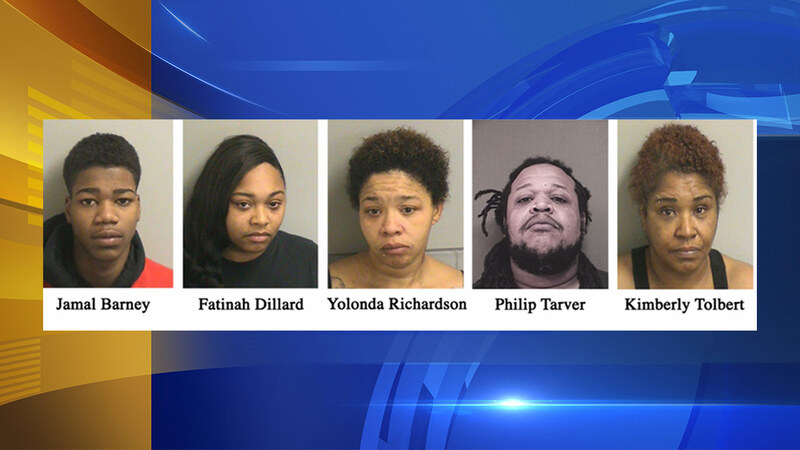 A drug raid was conducted, and Yolonda Richardson, 37, of South Toms River; Kimberly Tolbert, 51, and Fatinah Dillard, 25, both of Toms River, and Jamal Barney, 19, of Berkeley Township were all arrested. Agents and Task Force Officers seized over a half kilogram of cocaine, two hundred grams of crack cocaine, several ounces of fentanyl, and quantities of heroin and MDMA. Officer also uncovered a heroin manufacturing and packaging facility at the South Toms River location. This facility had items commonly used to "cut" heroin and fentanyl and numerous empty bags used to distribute heroin. Officers also seized over $210,000.00 in U.S. currency and a loaded handgun. Philip Tarver was not present at the time the warrants were served, but a no-bail warrant was issued for his arrest. Tarver was located and arrested on February 8, 2018, by Brick Township Police Department where he was found to be in possession of a large quantity of heroin and ammunition. Yolonda Richardson was charged with (first degree) possession with the intent to distribute cocaine, (first degree) maintaining a heroin manufacturing facility, possession of cocaine and crack cocaine and possession of marijuana. Philip Tarver, Kimberly Tolbert and Fatinah Dillard were charged with possession of cocaine with the intent to distribute, possession of cocaine, possession of heroin/fentanyl, possession of a firearm during a CDS offense and possession of MDMA. Jamal Barney was charged with possession of heroin and possession of marijuana.